BoXedVDI is an easy and affordable VDI solution and the ultimate alternative to the traditional VDI solutions. 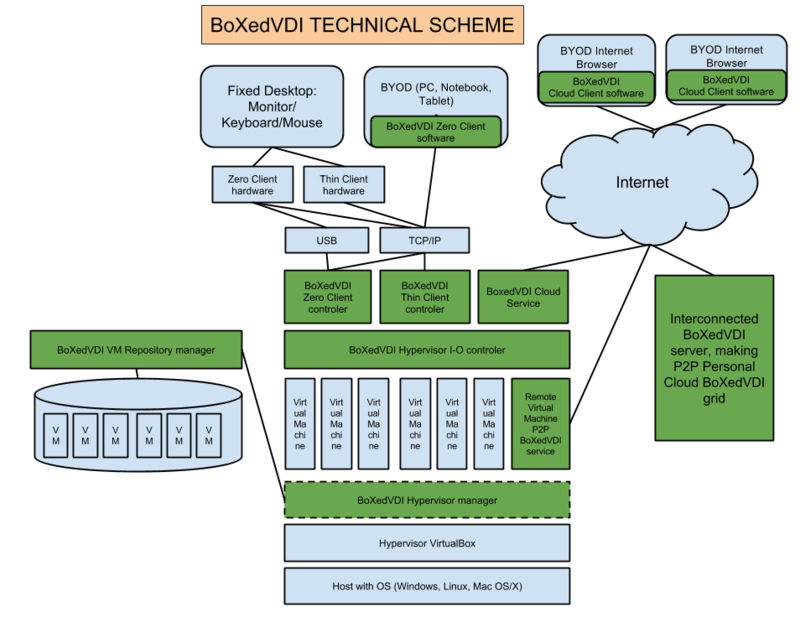 BoXedVDI is an easy to deploy and manage end-to-end VDI solution that is fully Hypervisor, Hardware and OS agnostic. BoXedVDI provides the basis for all LISTEQ’s products, including LISTEQ Cloud Desktop, LISTEQ MultiSeat and LISTEQ SecondPC. A demo version of BoXedVDI can be provided on request at services@LISTEQ.com. OS/Hardware agnostic – BoXedVDI supports all commonly available operating systems and supports all types of Zero/Thin Clients. Multitenancy – Each end-user receives a separate virtual environment for optimal security while suppliers/providers are able to manage multiple users from one platform. Self-Service – Simple provisioning from the cloud enables self-service of Virtual Desktops without the need of additional hardware/software. Low cost – BoXedVDI’s Open Source basis eliminates any third-party (incl. Microsoft) licensing fees, commercially favoring any competitive offerings. BoXedVDI’s architecture comprises of server(s) running a Hypervisor and the BoXedVDI Virtual Machines (VMs). – BoXedVDI uses Oracle VirtualBox as its native Hypervisor. Other Hypervisors can be supported through their own specific I/O layers. – BoXedVDI runs on top of the native I/O layer of the Hypervisor (not using any Client agents or VM RDP stack). Therefore BoXedVDI can support any OS running within the Hypervisor. Running VMs based on Windows, Linux, ChromeOS, DOS, Mac OS X and even Android x86 are possible. – BoXedVDI has the option to use the RDP stack of the VM, making it possible to provision Terminal Server based VDI configurations. BoXedVDI has an integrated RDP Client connector to communicate with the RDP Server stack. – BoXedVDI has a very advanced inter-connectivity protocol making a grid of BoXedVDI servers completely transparent for management and users. – BoXedVDI has a special hosted internet service (www.BoXedVDI.net) which makes it very easy to share Private Cloud VMs in the Public Cloud. The setup of this service and communication with privately hosted BoXedVDI is completely firewall transparent. – BoXedVDI has a complete integrated HTML5/Websocket Client-server engine, making native HTML5 communication with BoXedVDI’s core possible. No additional gateways are needed to set up a BYOD infrastructure based on HTML5. – Besides support for all types of Thin/Thick Clients, BoXedVDI also provides direct access to the native protocol of graphics-over-USB chipsets (DisplayLink and SMSC), through which low-cost ultimate Zero Clients can be used. – BoXedVDI supports “Hot-Desking”, provided that Clients are connected to the same Host. – BoXedVDI has different ways to provision VMs to a specific user or physical Client machine. ● Dedicated assignment of VM. ● Assignment of VM from a pool of VMs. ● Assignment based on a PXE boot of VM. ● Assignment of a fixed VM appliance. – BoXedVDI uses native storage support of different Hypervisors. Storage support within Oracle VirtualBox makes native use of iSCSI and ZFS possible, which provides the option to use low-cost SAN and NAS solutions.